If the main reason you like musicals at Stratford is the pretty costumes, then “Hello, Dolly!” is the right show for you. If, however, you like musicals because you like to get involved in the story and like to hear leads who can sing, then this “Hello, Dolly!” is not for you. You’d be better off at the Festival’s production of “Into the Woods” at the Avon. Jerry Herman’s “Hello, Dolly!” (1964) is one of the more vapid Broadway musicals of the 1960s. It is based on Thornton Wilder’s play “The Matchmaker” (1954), which is in turn based “Einen Jux will er sich machen” (1842) a Viennese farce by Johann Nestroy, itself based on an English farce “A Day Well Spent” (1835) by John Oxenford. Wilder reset the play in New York in the 1890s, the “Gilded Age”, as Mark Twain called it, a time of conspicuous consumption when a few American businessmen like Andrew Carnegie became exceedingly and unashamedly wealthy. Wilder’s title character, Dolly Gallagher Levi, is a proto-socialist. She seeks to marry the rich, tight-fisted Horace Vandergelder not just for her own security but because she thinks money should be “spread around”. While this phrase remains in the musical, Herman has otherwise deleted most of Dolly’s social philosophizing. Written at the time of Vietnam, Woodstock and the Beatles, “Hello, Dolly!” has nothing to do with its own time. It presents a whitewashed version of America in the supposed “good old days” as an escape for middle-class Americans from the disturbing realities of the day. One wonders whether the Stratford Festival is presenting such escapist fare now for the same reason. What has made “Hello, Dolly!” last is that it is a great vehicle for female star with a larger-than-life-sized personality like original Dolly, Carol Channing, or with a strong voice, like Barbra Streisand in the movie version. Stratford’s Dolly, Lucy Peacock, has neither. Peacock has already demonstrated on two previous occasions--“My Fair Lady” in 1988 and “The King and I” in 2003--that she can’t sing any better than the average audience member with a bad cold. Most often she uses a diseuse style of speaking to music to get through, when a song like the Act 1 finale “Before the Parade Passes By” requires real strength, she simply can’t do it. Whether she does or doesn’t hold a note seems to depend not on the music but on how much wind she has left at the moment. Why Stratford would wish to showcase this deficit in her talent yet again is a mystery. Fine acting from Peacock would be some compensation, but she falls back on a set of all-purpose comic gestures she’s acquired. She swaggers about the stage shooting off her one-liners with such artificial delivery she seems to be parodying the character not playing it. She has studied up on 101 ways to smile in hopes that if she continually looks pleased with herself, so will we. Since Peacock can’t carry the show, it would help if she had some support, but she has little. As Horace Vandergelder, Peter Donaldson is merely stern, not intimidating. At least as it is directed, his decision to give in to Dolly comes as a complete surprise when it could have been carefully prepared. Donaldson also cannot sing. As the milliner Irene Molloy, Robin Hutton has the opposite problem--she can sing but can’t act. Her big song “Ribbons Down My Back” requires an operetta voice. She has it but it is small and fragile. Amy Walsh tries much too hard to be funny as Irene’s employee Minnie Fay. In fact, the only one of the principals who knows how to pull off a role with style in such a fluffy show is Laird Mackintosh as Vandergelder’s employee, Cornelius Hackl. Mackintosh is the only one who gets the necessary combination of innocence and elegance just right. Since he can sing as well as act, it’s no surprise that his big number “It Only takes a Moment” is also the only solo in the entire evening to make a positive impression. Two fine actors are wasted in silly roles--Kyle Blair as Ambrose Kemper and Dayna Tekatch as Vandergelder’s daughter Ermengarde, who does nothing but burst into tears whenever she appears, a supposedly comic effect that soon becomes annoying. Barbara Fulton has a fine turn as Ernestina, a woman of dubious character, and Thom Allison is suitably supercilious as Rudolph Reisenweber, the commander of the wait staff at the Harmonia Restaurant. Lawrence Haegert makes little impression as Cornelius’s sidekick Barnaby. Patrick Clark’s handsome set and costumes are suggest a period of ostentation without themselves being ostentatious. Susan H. Schulman’s direction for Stratford has tended toward excess. We do wonder the show really needs two different removable staircases or a complete trolley car that is turned around on the double revolve for no particular reason except to say “Look at the money we spent!” For most of the show Michael Lichtefeld’s choreography is uncharacteristically bland. He seems to have saved all his imagination for the riotous “Waiters’ Galop” of Act 2 that is the single highpoint of the evening. As usual, Kevin Fraser’s lighting reinforces the mood of every scene. 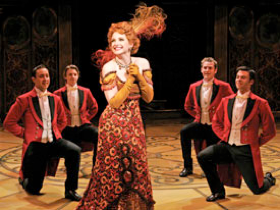 To come off well, “Hello, Dolly!” needs a central performance with charisma. This has none. As a result the show seems like a huge, rather expensive wind-up toy that mindlessly plays itself out. Let’s hope Dolly never comes back like this again. Photo: Lucy Peacock as Dolly Levi. ©2005 Stratford Festival.